I wonderful rhyming tale that shows how the little spiced boy saves the day during a visit to the firehouse. Neo loves all things firefighter.. and thankfully not the pyrotechnics themselves. Cute retelling of the Gingerbread Man. This time he goes with his class to visit the fire station. Suddenly he finds himself being chased by Spot the Dalmation. His escapades lead to a ride to squelch a fire. Illustrations are a bit weak. Gingerbread Man goes on field trip to firehouse, has wild time. As part of the picture series about the Gingerbread Man, this book is the perfect picture book primer for comic books and graphic novels and includes an engaging story that is great to read aloud. My little one didn't care about all of the information about the fire station, but I know of other preschoolers who would love this element. An Imagination Storytime Read (3yo). I was going to give this book a 2-Star rating, but the rhyming is good and the Fire Chief is a woman, so it gets 3. This book didn't thrill me, but the 3yo liked it. There is nothing objectionable about It at all., and the graphic novel style was actually pretty cool, but there are better stories. Cute and informative with comical illustrations - would be an adorable read aloud during any sort of fire safety week/program. This was a fun read for my kid. He insisted on reading it twice in one sitting. Has some elements of Stick Man which we all really liked. What a fun update on The Gingerbread Man. He gets out and meets the dog and gets to ride the fire truck. My grandson's favorite. The pint size hero of The Gingerbread Man Loose in the School (Putnam, 2011) returns for a class field trip to the local fire station. After their teacher announces they’ll be riding the bus to meet the fire fighters, Sophia reassures the Gingerbread Man that she can take him along in the pocket of her backpack. But just as the class reaches their destination, the little cookie falls out of his hiding spot and falls right on top of Spot, the hungry Dalmatian. Readers familiar with the traditional tale will relish the similarities as the Gingerbread Man evades being eaten, shouting, "I'll run and I'll dodge, / As fast as I can. / I'm not a dog bone! I'm the / Gingerbread Man!" (p. 11) The ensuing chase leads throughout the fire house, into the truck, up the shiny pole, through the bedroom and into the kitchen. When the alarm sounds, the fire fighters rush to the truck and the Gingerbread Man hops aboard, riding to the rescue. Murray’s bouncing rhythms keep the story moving at a quick pace, and are matched by Lowery’s action-packed cartoon-style illustrations. In the end, female Fire Chief Anne rewards the little hero and his classmates with helmets, paralleling many children’s own trips to the fire station. This terrific read-aloud will surely be requested for repeated readings. 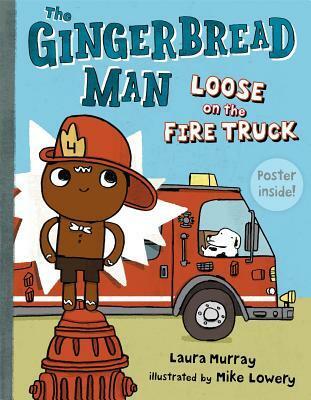 This is a fantastically rhymed book about a gingerbread man who visits a firehouse. It has a very humorous narrative that children will find silly and entertaining. I especially enjoyed periodically shouting out, "I'm the Ginegerbread Man!" whenever it came up, such as in the following:I'll VROOM and I'll ZOOMAs fast as I canI'll steer this big truck, I'm theGINGERBREAD MAN! !The illustrations are laid out like a graphic novel, so this could be a good introductory book to comics for young children. My 4yo really enjoyed the story. I have read many versions of the Gingerbread Man that fit the similar written pattern of the original story, this one doesn't follow the pattern. The Gingerbread Man avoids 1 attempt at being eaten only to rush toward danger to aid firemen while they battle a house fire. The story was just o.k. for me. I think it would be fun to share with a group of kindergarten age students after reading the original story (one where the Gingerbread boy survives) to show what the cookie went on to do next. This book arrived at my branch today, and I am so pleased with it! The amount of words is not overwhelming, its rhymes give the story a great pace, and the fire chief is a woman!The art and layout is very reminiscent of a graphic novel, which excites me as well. The illustrations are simple but an effective partner in telling the story of the gingerbread man's visit to a firehouse with his class friends. I'm really, really looking forward to including it in Gingerbread Storytime next month! Yay! Another fabulous gingerbread story to add to my collection! And it's signed by the lovely Laura Murray ~ "for Mrs. Merrill to share during one of her "Book Breaks". Get fired up over reading!" Love the little gingerbread guy as he heads off to the fire station with his class on a field trip. As he attempts to avoid the station's Dalmatian, Spot, gingerbread man ends up on the truck and ends up a hero! These Gingerbread Man stories are cute, they rhyme, and take the “cookie” on adventures. This one concerns a school trip to the fire department where the Gingerbread Man ends going to a fire, almost falling into the jaws of the firemen’s Dalmatian, but escaping just in time to help put out a fire. It’s a time to suspend belief that anything is close to true, but just time to enjoy the silliness of the adventure, the rhymes, and the survival of this sweet cookie! A sequel to "Loose in the School," this gingerbread man book from Murray does a better job of rhyming. However, the repetitive refrain is inconsistent. Children love to have a part in reading a book. Books that have a repetitive refrain are the best. But in this story the author changes the refrain each time. Rather disappointing.Children will enjoy the fire fighters, trucks and station. But this story, like it's prequel, is not recommended for storytime read-aloud. This was such a wonderfully well done book. The rhyming, illustrations and playful movement of the work were a delight. I enjoyed reading this Gingerbread Man adventure to my children. They are so completely taken with him. It goes without saying that any time we come across a book about or related to him, it becomes an automatic read for us. I would add this to our home shelf with no hesitation.I secured this title from our local library. Age: Preschool-1st gradeFood: CookieFairytale: Fractured sequel I am so in love with the writing style of Murray. I'm going to have so much fun reading this aloud in storytimes. Not only is the rhyme and rhythm boisterous but the story line sequence is relatively logical with no gaps in the story. This is very cute story about a gingerbread man that visits a fire station with his class. Some the dog at the fire station notices the gingerbread man and decides to chase him. This would be a good a good story to read to young students that might be visiting a fore station soon. My favorite feature about this book is the rhythm. My 3.5yo loved it! The rhythm of the story rhyme is SO FUN to read! I checked this out for my niece's fire truck themed birthday party. It is pretty cute with fun illustrations and great rhyming. It was also nice to see that it goes against traditional gender roles and has a female fire chief. Another rhyming picture book following The Gingerbread Man Loose in School. This time the Gingerbread Man joins his class on a field trip to the library. A fun story to share before visiting a fire station. I tagged this as a graphic novel even though it's not a graphic novel because I think this book is a good ladder into graphic novels. The panels make this more than just a picture book, but a window into the world of graphic novels for young children. A good read-aloud for preschool storytime. Laura Murray Mike Lowery - Laura Murray was a teacher before becoming an author, is a popular speaker at schools, and has had to deal with many an escaped Gingerbread Man in her day. She is the author of THE GINGERBREAD MAN LOOSE IN THE SCHOOL, and the Gingerbread Man’s continuing school adventures - THE GINGERBREAD MAN LOOSE ON THE FIRE TRUCK, THE GINGERBREAD MAN LOOSE AT CHRISTMAS, and THE GINGERBREAD MAN LOOSE AT THE ZOO (2016). This humor-filled, rhyming series was inspired by a Gingerbread man that managed to escape her classroom every single school year. Her first book won the 2014 Virginia and Illinois Reader's Choice Award, and was nominated for 7 other state awards as well; is a Junior Library Guild Selection; a Florida Children's Choice Award Honor book; and received a starred ALA Booklist review. Laura lives with her family in northern Virginia. Visit her online at LauraMurrayBooks for loads of fun activities and lessons, standards-linked teacher's guides, as well as information on school author presentations.